My name is Missy. Feeding people and cooking gives me joy. I've found a way to make cooking something I can do to glorify God as well. For the past few years I've been making some extra meals for the freezer ministry at my church and for friends. I've collected quite a few recipes and wanted to make a blog to share them. That way if you have someone you know that is in need of a meal, you'll have a resource to check out. Enjoy and God Bless! It's been awhile since I posted a meal. I had a baby boy named Evan 16 months ago and life has been crazy!! He is amazing and exhausting all at the same time. 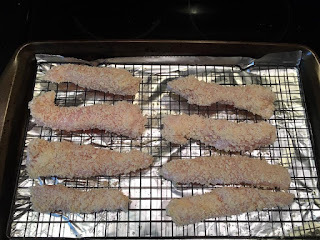 This recipe for Parm Panko Chicken Tenders came about because I was trying to get Evan to eat more protein. I figured what was better than chicken tenders. I wanted to make them baked instead of fried. 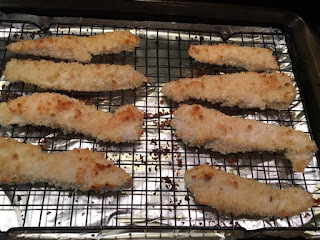 The panko really helps to get them crispy without having to fry or use any oil. Plus he loves cheese so that was an easy add. I make a big batch of them then freeze half. To reheat them, I use the toaster oven. My advice is to cook them to 165 exactly. That way they won't be dry when you reheat them. Because they freeze so well, this would work as an awesome freezer meal. Just bring a salad and a side and you are all set. Preheat over to 425 degrees. Line a baking sheet with foil. Spray a cooling rack with cooking spray and put on top. 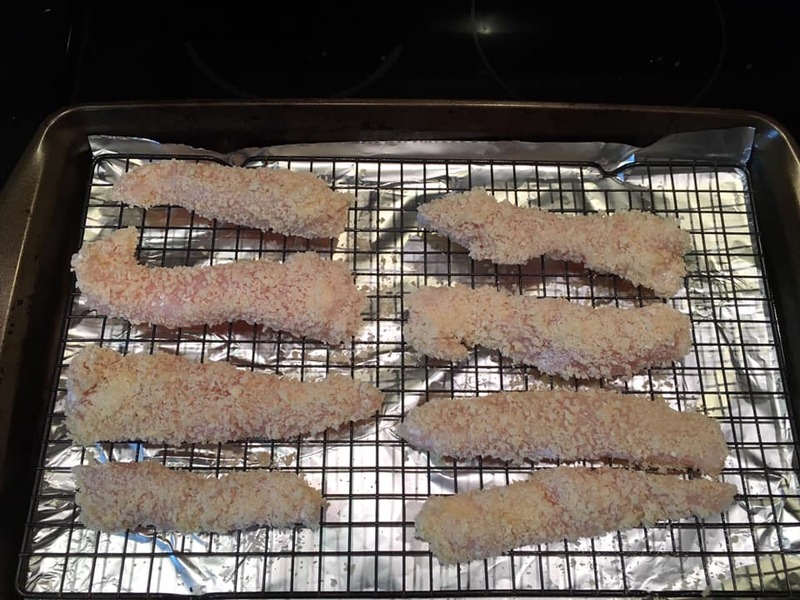 By cooking the tenders on a cooling rack, you don't have to flip them and they get crispy on both sides. Make your breading assembly line in this order. Now bread each piece of chicken and place on cooling rack. My tip is to use only one hand. That way you have a hand free in the end when you need to wash up. Make sure to leave room around the chicken when you put it on the rack. 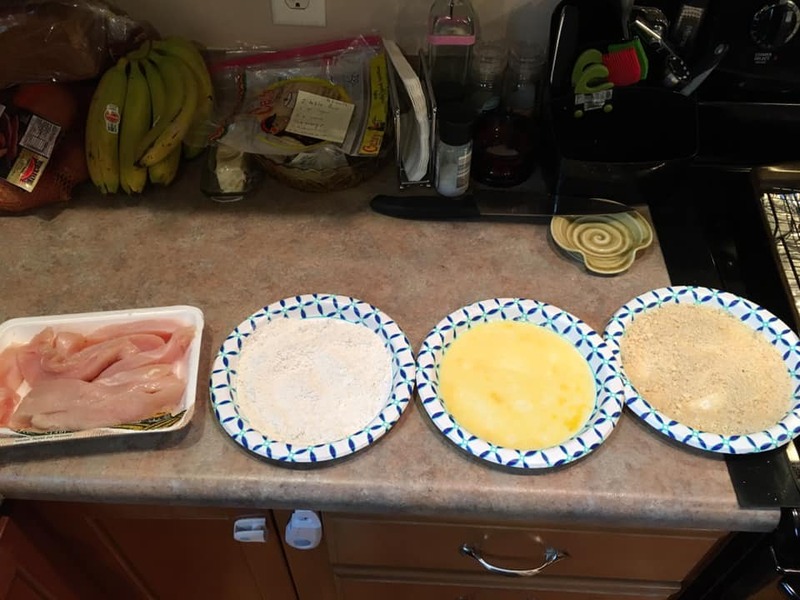 Bake chicken for around 15 minutes. You want the internal temp to be 165. Do not over bake!! Hi friends! 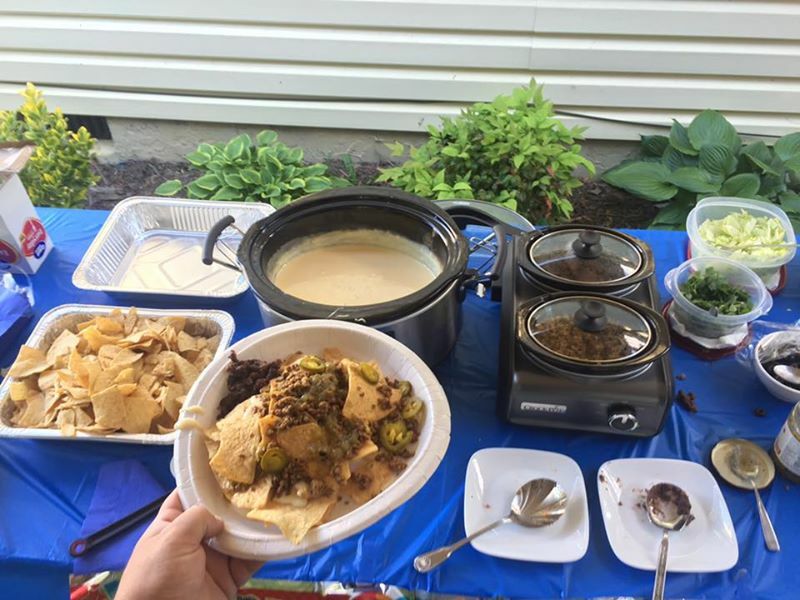 For my dear husband Adam's birthday we decided to throw him a Nacho Party! I made nacho cheese, taco meat, beans, and got lots of fun fixins. We hosted the party at our friend Mary Helen's house. Adam was very happy with the results. After the party we had a bunch of leftover taco meat. I decided to make a freezer meal out of it of course. This is a recipe I made up. 1. 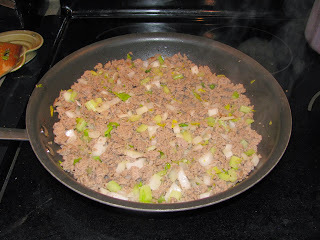 Cook ground beef until browned. Drain grease. Add Taco Seasoning and liquid according to the package directions. I like to use beer instead of the water the package suggests. Simmer until most of the liquid has cooked out. 2. While the beef is cooking, boil water and cook pasta to al dente. Save out 1/2 cup of the cooking liquid that you pull out right before draining the pasta. This stuff is magic! 3. In a large bowl combine beef, rotel, soup, reserved cooking liquid, and pasta. Mix well. 4. Place mixture in a sprayed baking dish. Top with shredded cheese and sprinkle with chili powder. 5. 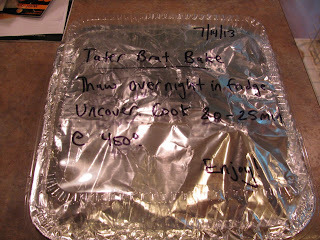 If making ahead, cover with plastic wrap, foil, and label. Freeze. 6. To bake: Thaw for 24 hours in fridge if baking from frozen. Uncover, bake at 350 degrees until browned and bubbly. Feel free to add more vegetables to this dish. I would suggest corn or black beans. Also, when it comes out of the oven, some chopped green onions or cilantro would be excellent on it as well. I hope you try this recipe out. It makes quite a bit, so it's a good one to make one for your family and save one for someone that could use a nice homemade meal! Hello everyone! I've got a freezer meal coming soon for you but today I wanted to share a slow cooker meal that I made over the weekend. I love using the slow cooker during the summer when it's hot but you don't want to heat up your house. I tweaked the recipe to make it more tasty!! Spray slow cooker with cooking spray or use a slow cooker liner(I <3 these). Add the first 6 ingredients to slow cooker. Stir everything up so it is all combined as shown below. Cover; cook on low heat for around 5 hours. Serve meal in shallow bowls, sprinkled with feta and parsley. Hello friends! 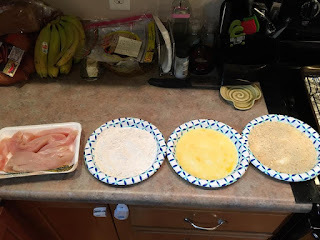 Today I'm not posting a freezer meal, but a meal that is very versatile and a great way to make one easy meal that will translate into many other meals. I'll show you one such extra meal that I made that was awesome. It's like getting two meals for one! A side note: I love this cookbook. Even if you don't eat low carb, it's a great resource to make some healthy, new slow cooker recipes. Our local grocery store had whole chickens on sale last week. I remember seeing in the cookbook a way to make whole chicken in the slow cooker. There is another recipe in the book for chicken piccata that uses boneless chicken breasts. I decided to combine the two recipes. Spray slow cooker with cooking spray to make for easy cleanup. Put as many of the lemon pieces and you can fit into the cavity of the chicken. Coat chicken with olive oil and sprinkle with salt and pepper. Put chicken into the slow cooker breast side down. In a small bowl, combine wine, Tabasco, and tapioca. Mix thoroughly until completely smooth. Pour mixture into slow cooker. Place remaining lemon pieces into slow cooker as well. Cover and cook on Low for around 7 hours. How long will depend on the size of your chicken. Check doneness with an instant-read thermometer(it should register 170 degrees). If you have a 4 pound chicken, you might want to start checking at 6 hours. When done, remove chicken from the slow cooker and let rest prior to serving. The chicken is delicious served by itself with a little of the slow cooker juices. It's also great the next day on salads or in sandwiches. I decided to take it a step further and it took it over the edge! After removing the chicken from slow cooker, use tongs to squeeze lemon pieces to release all juices into the chicken juice that is already in the slow cooker. Discard lemon rinds. Cook frozen cauliflower in the microwave according to the directions. Once cooked, cut any large cauliflower pieces into bite sized pieces. Add cauliflower and shredded chicken to slow cooker with juices. Stir to combine. To serve, ladle into bowls and stir in chopped parsley. TIP: An easy way to add parsley is to use scissors. Just clip right over the bowl. Please note, if you are not a big cauliflower fan there are other great options. I would also suggest cooked rice, noodles, broccoli, kale, or spinach. If you are using the rice or noodles, only add what you are going to eat right then, as leaving them in the liquid will cause them to bloat. I hope you enjoy this meal. Let me know if you tried it and how it went. Also let me know if you thought of a great variation! Hi Everyone! It's been a long time since I've posted a meal. I've still been making freezer meals but I've been too lazy to put up any recipes. Well that changes today! Today I'm showing you a stuffed pepper bake. This is a recipe that I made about a month back. It's very easy and a great way to use up any extra peppers that you may have. It's also much easier then stuffing peppers like in a normal stuffed pepper dish. As far as modifications, instead of using red peppers only, I used a red and an orange pepper. The recipe would work well with whatever kind of sweet peppers you have, even green. I also added some fresh garlic and extra Italian seasonings to the meat/rice mixture and eliminated the garlic salt from the topping. You could also substitute ground turkey for the ground beef and white rice for brown rice. The recipe makes enough for two 8 x 8's. I encourage you to make one for your family and give one to a friend or neighbor. Cook rice according to package directions and set aside. 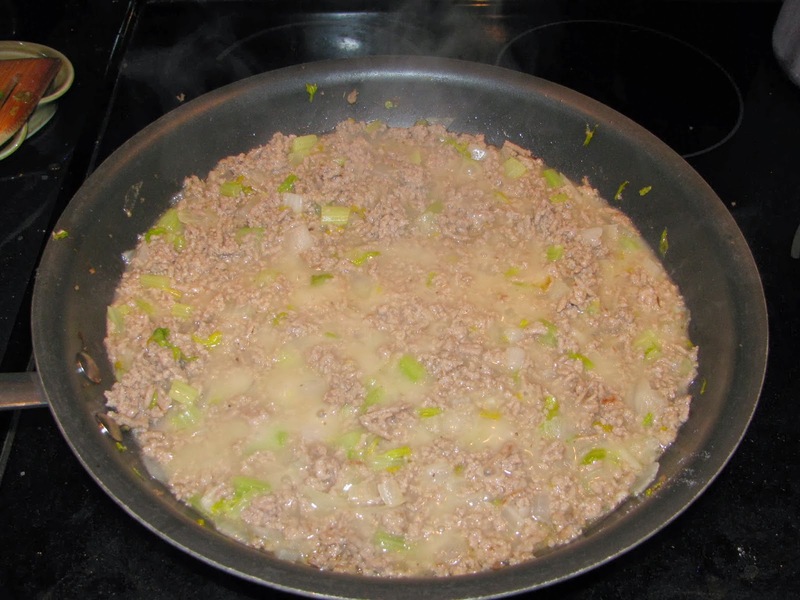 Meanwhile in a large skillet, cook hamburger , peppers and garlic until meat is done and no longer pink; drain grease. Stir in rice, spaghetti sauce and one teaspoon of the Italian seasoning, let cook until heated through. Pour this mixture into two 8x8 casserole dishes. Top with the two cheeses. 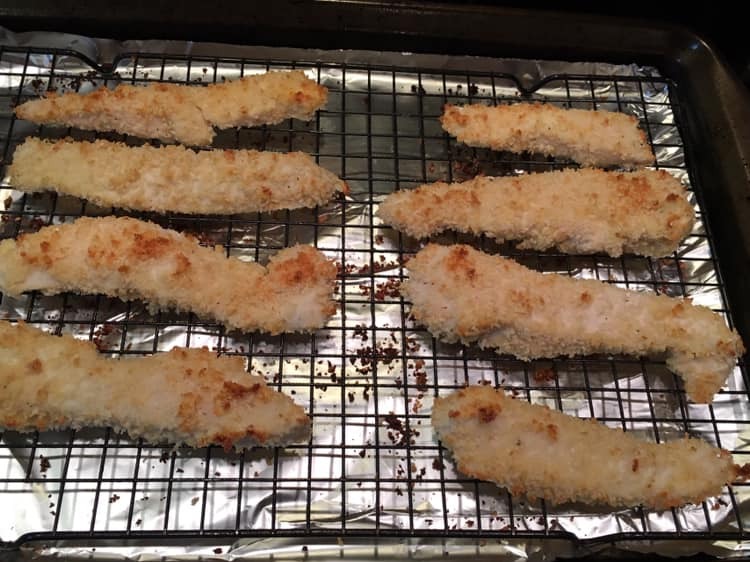 In a small bowl combine bread crumbs and Italian seasoning with a drizzle of olive oil, toss to coat. Sprinkle on bread crumbs. If you are a person that can't get enough Thanksgiving then I have a great meal for you today. This is an original recipe that I came up with a few years ago and have tweaked. It's a great meal to make now because you can take advantage of great Thanksgiving sales at the grocery store. It's also a great meal to use up those Thanksgiving leftovers. 1. Brown the turkey in a large skillet. I used 85% lean turkey. If you are using leaner turkey or leftover turkey, you should increase the amount of olive oil to 2 tablespoons. 2. While the turkey is cooking, dice the sweet potatoes and put into medium pot. Cover with water and bring to a boil. When they start boiling, add some salt and reduce heat to 80% and allow to cook till tender. 3. When turkey is about 90% browned, add the celery, onion, thyme, salt and pepper. Let turkey finish cooking and allow veges to start to soften. 4. When the turkey is 100% browned, add the flour. Stir the flour around and cook for about 1 minute or so. Add the broth and bring mixture back to a bubble. The sauce will be very "saucy". This is exactly the way you want it. Once the mixture thickens, reduce heat and cook another 5 minutes. Remove from heat and allow to cool a few minutes. 5. Drain the cooked sweet potatoes and return to hot pot. Add butter, half and half, nutmeg, salt and pepper. Mash till mostly smooth. I enjoy some lumps. If you don't like lumps, keep mashing. 6. Place turkey mixture in the bottom of a 13 x 9 pan. Dollop sweet potatoes on top. The sweet potatoes don't spread easily. I find it best to dollop the sweet potatoes in large spoonfuls all over the turkey mixture then spread them out with the back of a spoon. Top with cheese. 7. If freezing, cover, label and freeze till ready to use. To reheat, thaw for 24 hours in fridge. Bake 35-45 min at 350 degrees till warmed through and top is browned and bubbly. 8. 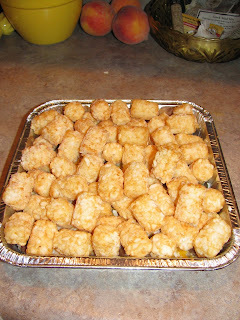 If serving right away, bake 25-30 minutes at 350 degrees until top is browned and bubbly. I hope you guys enjoy this meal as much as I do. It's a great way to make Thanksgiving anytime of year. Also remember to make it after Thanksgiving to use up all those leftovers. 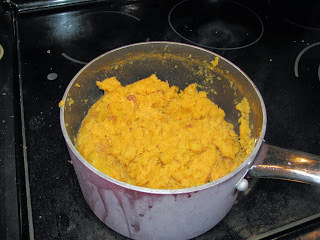 If you have leftover mashed potatoes(or sweet potatoes) from Thanksgiving, you could even skip a bunch of the steps! I'd also like to encourage you to make this meal for someone that needs it this time of year. I'm going to donate mine to the freezer meal ministry at church. I mostly followed the recipe, but added a few special touches! This is a great one to double. Make one for now and one for later. 1. In a large saucepan, combine bratwurst, beer, and water. Bring to a boil. Reduce heat. Cover and simmer for 10-15 minutes or until a thermometer reads 160° Drain and cut into 1/4-in. slices. 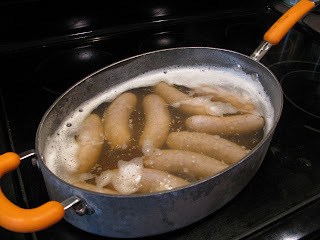 In the same pan, brown brats in butter over medium-high heat until crispy; drain on paper towels. Brats spending time in the beer Jacuzzi! 2. Spoon sauerkraut into a greased 13-in. x 9-in. baking dish. (I used 8 x 8's for this because it works better for me.) Top with brats. 3. Combine soup, milk, mustard, nutmeg, and black pepper in a medium bowl. Whisk up so the mixture is very smooth. Drizzle soup mixture over the brats and sauerkraut. Sprinkle with shredded cheese. Top with Tater Tots. Ready for the oven or freezer! 4. If freezing ahead, cover well, label and freeze now. Check out the picture below of how I label. Date, what it is, and directions help to make life easier when its time to bake it. 5. If making for now, bake at 450° for 25-30 minutes or until potatoes are lightly browned. 6. To serve from freezer, let thaw for 24 hours in fridge. Uncover. Bake at 450° for 25-35 minutes or until potatoes are lightly browned. Hope you enjoy this! Let me know if you try it and how it turned out. I'm always looking for feedback. I'm a 30 something year old woman originally from Illinois. I love my family and friends, cooking, exercising, bible study and learning. I'm a happily married SAHM and have a handsome son name Evan.